Branscombe Lodge with a 4 star English tourist board rating is in the garden of The Old Higher Lighthouse, which was last rebuilt in 1869. Originally Branscombe's use was as the paraffin store for the light. It is now a 2-bedroom cottage. One double bedroom and one twin. Both are on the ground floor together with the bathroom and kitchen. While upstairs is given over entirely to a large sitting room with windows on all four sides with sea and coastal views from them all. The sitting room has TV and DVD players as well as a HI-FI and small library. 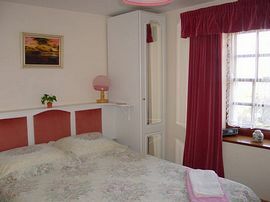 The cottage is well furnished and is kept very clean. 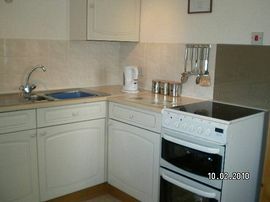 The kitchen is fully equipped with new full size electric cooker, microwave, washing machine and tumble drier. 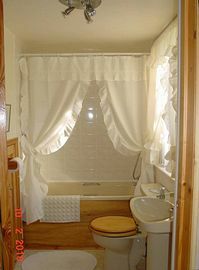 The bathroom has a shower over the bath and hot water is supplied by off peak electric, with normal tariff backup. The cottage was re-carpeted and decorated and is fresh and inviting. All rooms have sea views. Heating is also by electric off peak and is very efficient. Guests have access to the lighthouse tower/observatory where they can watch the sunset or view surrounding sea and countryside through the gun sight binoculars. The property is set in a rural area with no through road. Our access road is a private one and parking is right outside the kitchen window on our own property. The garden is large and decorative with a private BBQ area with table and chairs. Also in the grounds is a swimming pool and Jacuzzi, which is heated and seasonal. Almost without exception the pool will be used solely by holiday guests. Fran and Les have been the owners since 1981 and have lovingly restored the property from dereliction. The property built as a lighthouse and sold off into private ownership in 1906 when it was superseded by a new one. It has had several owners the one of most note was Dr Marie Stopes who was the pioneer of birth control, but many famous names have visited here. G.B.Shaw, Thomas Hardy, H.G.Wells, Margot Fontayn. Last but not least King George lll who came to see "This new lighthouse I have heard so much about." The Royal Manor of Portland is technically an island although connected to the mainland by a bridge. It is 4 miles long and 21/2 miles wide. There are several villages with shops, but Weymouth is 10 miles away with its wonderful sandy beach, shops and things to do. Portland Bill stands at the southern most tip of the island and is quite unspoilt. Walking is almost entirely unrestricted and the views are those of the Jurassic coast in all its glory. Sports include sailing, windsurfing, fishing, diving, kite flying and even climbing. We do not accept animals or children under 5 years(Due to fishponds). We are also entirely non-smoking. Rural coastal views very peaceful setting. Large ornamental garden with seasonally heated swimming pool and jacuzzi. Private garden area with BBQ and garden furniture. Local Services: local grocery shops,Bank,Post Office,Restuarants,Public houses,Doctor,Chemist. Community Hospital. To Weymouth then bus to Portland Bill, walk up the hill behind the pub to the end of the track. Reception is down to the right. Follow signs to Weymouth then the A354 to Portland Bill, after passing the all white lighthouse on the left hand side of the road take the first turn to the right, immediately prior to the left hand bend. Road named Higher Light lane. Follow it up the hill to the end. Reception is down to the right as you approach the wall. 1)"Thanks Les and Fran for a very warm welcome and guided tour! 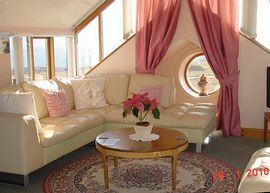 We had a comfortable stay and a very restful, peaceful holiday in beautiful surroundings - a little piece of paradise! Wonderful." 2)"First class accommodation. Wonderful views and unique property." 3)"Had a great time here. Cottage clean and homely, hosts charming and friendly. Views stunning, night sky amazing. 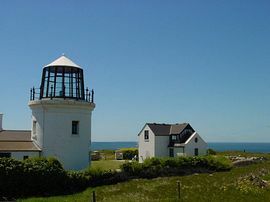 Would give this lighthouse a first class recommendation, a haven from the outside world."